SEATTLE, Sept. 24, 2008 — Boeing [NYSE: BA] has, with leading air carriers and Honeywell’s UOP, a refining technology developer, established a group to accelerate the development and commercialization of sustainable new aviation fuels. 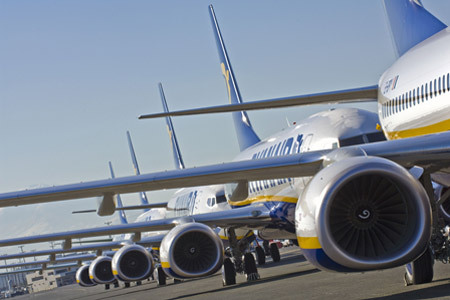 With support and advice from the world’s leading environmental organizations, the World Wildlife Fund (WWF) and Natural Resources Defense Council (NRDC), the Sustainable Aviation Fuel Users Group makes commercial aviation the first global transportation sector to voluntarily drive sustainability practices into its fuel supply chain. The group’s charter is to enable the commercial use of renewable fuel sources that can reduce greenhouse gas emissions, while lessening commercial aviation’s exposure to oil price volatility and dependence on fossil fuels. Airlines supporting the sustainable fuels initiative include Air France, Air New Zealand, ANA (All Nippon Airways), Cargolux, Gulf Air, Japan Airlines, KLM, SAS and Virgin Atlantic Airways. Collectively, they account for approximately 15 percent of commercial jet fuel use. “Bottler” Brown, Scottish Prime Minister unelected, was given the kiss of life on stage by his wife at the Party Conference. Commentators believe he did just enough to secure his position until November. Brownites claim a triumph that will see him through to an election in 2010 and then five more years – living on another planet does wonders for ego. The basis of Bottler’s speech was that he had made a series of terrible errors and that made him the man to lead Britain into the ground. In a difficult financial environment, with the world slipping into depression, Bottler has unerringly made the wrong decision at every turn and is now trying to spend his way out of trouble. Unfortunately, British taxpayers get to pick up the tab. On the present performance, Bottler will at least secure a place in history equal to fellow national socialists Macdonald, Atlee and Wilson who also managed to cause Britain significant financial and social damage. Seabrook, Md., September 22nd, 2008 — The Securities and Exchange Commission (SEC) has awarded Lockheed Martin [NYSE:LMT] the Infrastructure Support Services (ISS) contract. Awarded under the U.S. General Services Administration Millennia Government Wide Acquisition Contract, the contract has a base value of $33 million and a total potential value of $122 million if all program options are exercised over six years. Lockheed Martin will increase performance of services by consolidating and integrating the SEC’s IT services. Lockheed Martin will provide transition services, program management support for Server Services, Managed Network Services, End User Computing, Service Desk and Pre-production services and other infrastructure areas. Services performed will be based on service level agreements designed to fit the requirements of the SEC to include service desk operations, data center support and operations management, technology deployment and support, and technology lab support. The Securities and Exchange Commission administers and enforces the federal securities laws, which protect investors, ensure equitable markets and promote capital formation. QinetiQ North America’s Technology Solutions Group announced that the US Transportation Security Administration (TSA) deployed its new mass transit security solution at the Minneapolis-St. Paul (MSP) International Airport to enhance security measures surrounding the 2008 Republican National Convention. TSA used QinetiQ’s groundbreaking millimetre wave, passive stand-off detection solution – called “SPO Technology” – to scan for weapons and explosive materials in and near MSP International Airport. SPO Technology has already proven successful in both air and surface transport use. 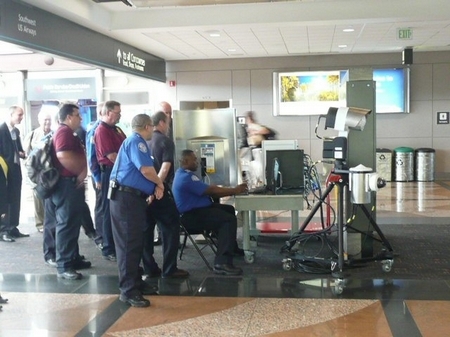 TSA for the very first time operationally deployed this new threat technology solution at the Denver International Airport during the 2008 Democratic National Convention. 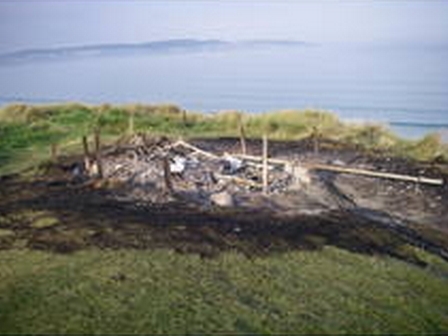 The RNLI lifeguard hut on Gwithian beach in west Cornwall was burnt to the ground on Thursday night (18 September). Police are currently investigating the cause of the blaze while the life saving charity counts the cost of replacing the hut and its contents for next season. A member of the public reported the fire at around 23.00 hours on Thursday night. Unfortunately due to its remote location, at the end of Peters Point, above Gwithian beach, the fire brigade couldn’t access the hut. They were forced to monitor the blaze from a distance as the hut burnt to the ground. 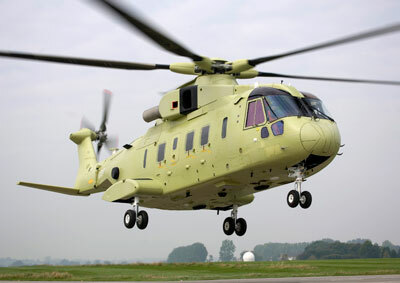 Yeovil, UK, September 22nd, 2008 — The VH-71 presidential helicopter program achieved another major milestone today when the first operational pilot production helicopter (PP-1) completed its maiden flight at AgustaWestland’s facility in Yeovil, England. A U.S. Air Force crew will transport the helicopter aboard a C-17 cargo aircraft to U.S. Naval Air Station Patuxent River, MD, in early October. 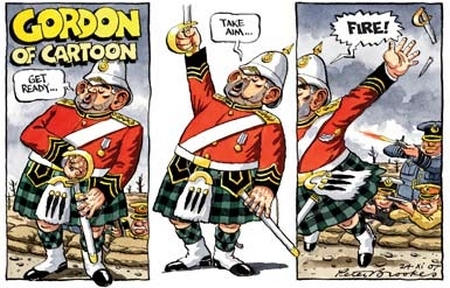 When the British Army played itself out of the American colonies, it was to the tune “The World Turned Upside Down”. It was an event of huge significance to global history. Freed of the burden of removing the French from the American colonies, Britain expanded its interests into Africa, Asia and the Pacific, while the colonists were free to expand across North America from their bases on the East Coast. In 1914, the world stumbled into war and set the seeds for the 1939-1945 War, and the turmoil that followed into the second half of the 20th Century. The 1914-1918 War set the beginning of the end of the British Empire, many of the next generation of leaders having been killed in the trenches, with much of the British gold reserves having been shipped to the United States to pay for munitions. The Crash of 1929 set the end for the British Empire as the country moved off the gold standard. In 1939, appeasement ended and World War Two began. An isolationist US tried hard to avoid entering the war but was eventually prompted when the Japanese attacked at Pearl Harbour. In 1945 a new world order started to form, with the US defending Western Democracy against the Soviet Union. 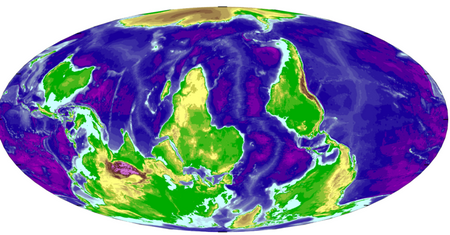 That global conflict ended with an impoverished Soviet Union collapsing. Suddenly there was no world order because the US was left as the only super power and global terrorism appeared to emerge as the next global threat. During the last weeks, financial crisis has begun to trigger the formation of the next world order. Western banking stands at the door of a new Depression. Temporarily, total disaster has been stalled by the US Federal Government nationalizing the liabilities created by uncontrolled banking greed, having allowed those failed bankers to privatize the profits. The roller coaster ride will continue for a time, but it will leave a world of uncertainty and power shifts that increase the prospects of major world conflict. FORT WORTH, Texas, September 19th, 2008 — U.S. Air Force analyses show the Lockheed Martin [NYSE: LMT] F-35 Lightning II is at least 400 percent more effective in air-to-air combat capability than the best fighters currently available in the international market. The Air Force’s standard air-to-air engagement analysis model, also used by allied air forces to assess air-combat performance, pitted the 5th generation F-35 against all advanced 4th generation fighters in a variety of simulated scenarios. The results were clear: the F-35 outperformed the most highly evolved fighters in aerial combat by significant margins. 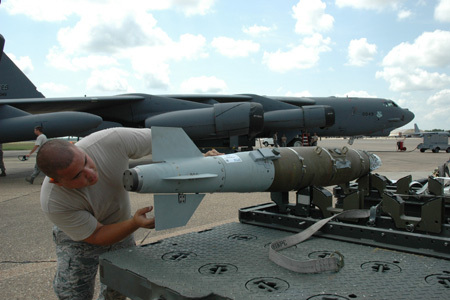 BARKSDALE AFB, La., Sept. 15, 2008 — An airman at Barksdale Air Force Base (AFB), La., loads a Boeing [NYSE: BA] Laser Joint Direct Attack Munition (LJDAM) onto a B-52H aircraft for a recent demonstration flight. It was the first time the LJDAM had been carried and delivered from a B-52H. The B-52H is a heavy long-range bomber capable of carrying the largest array of weapons in the U.S. inventory. Another demonstration flight is scheduled for later this year. LJDAM consists of the standard JDAM guidance tail kit as well as a laser guidance kit that acquires and tracks laser target signals. The weapon is designed to accurately and effectively engage stationary and fast-moving targets on land and at sea. The laser guidance also provides accurate alternative targeting in a Global Positioning System-denied environment. 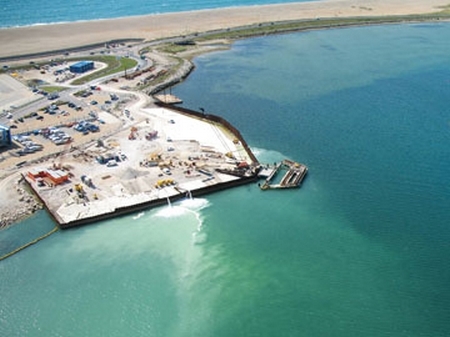 Construction work to enhance the sailing facilities at Weymouth & Portland for the 2012 London Olympic Games is racing towards the finishing line, the Olympic Delivery Authority (ODA) announced today. The Olympic and Paralympic sailing events in 2012 will be hosted at the Weymouth & Portland National Sailing Academy (WPNSA) which offers world-class facilities and some of the best small boat sailing conditions in the world. Construction work to improve the facilities is well on track to finish ahead of schedule, improving facilities for athletes training at the 2012 Games venue and for the 2009 Skandia Sail of Gold Regatta in September, the final event of the 2008-2009 ISAF Sailing World Cup.